When fan-casting Batman's arch-nemesis, it's likely that Leonardo DiCaprio's name comes up pretty often. He's a well-loved, versatile actor who's proven he can play a twisted villain, so why wouldn't his name come up? The partnership of DiCaprio and Joker took a big step forward today when it was reported that Warner Bros. was interested in casting the Oscar-winning actor for the role in the Joker origin film from Martin Scorsese. While a deal between the two may not come to fruition, it would be great to get a glimpse of what DiCaprio could look like as the Clown Prince of Crime. Fortunately, BossLogic has come to the rescue. The famed digital artist brought the vision to life for us this week, and it's even more exciting than we could've imagined. This take on Joker takes from both the Jared Leto and Heath Ledger versions of the character. The hair looks more like Leto's take from Suicide Squad, but it does have that classic DiCaprio swoop to it. The clothing, on the other hand, slightly resembles the Ledger version from The Dark Knight. And, like The Dark Knight Joker, this take has the permanent scars in the cheeks of the character. 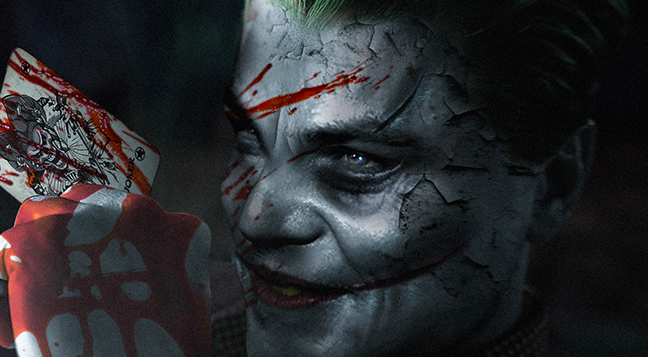 For the full, demented look at DiCaprio as Joker, as well a slew of other great pieces from BossLogic, head to the gallery below!